For the first half hour we are joined by Kurt Rodgers from Affordable Interest Mortgage describing Denver mortgage loans and home sales. Second half of of the show we learn to Trade Stocks with Online Trading Academy. There are three MAJOR things which you need to do TODAY to prevent you from headaches, identity theft, and costly expenses in the future! 1. CHANGE ALL YOUR PASSWORDS! A few weeks ago, a security breach was announced that affects about 25% of servers around the world. This means it’s not YOUR computer, but the computer you are connecting to that you thought was secure. On a danger scale of 1 to 10, it is an 11! It was actually discovered over 2 years ago and has been a vulnerability since 1 year before that. To make a complicated story short, when a hacker uses a special program on a company server who uses “OpenSSL” security, it will “bleed” out other information including people’s usernames and passwords. That is from this easy-to-read site. Over 1 MILLION servers were vulnerable 2 weeks ago. The average person logs into 25 websites daily, and you could waste the day checking to see if that server was vulnerable here. To simplify things, we suggest changing ALL your passwords TODAY. In 2007, the National Institute of Standards suggested 12 character passwords. So, 8 is OK, 12 is better. We created this printable Excel sheet to keep track of your passwords. Put it in a safe place for your family to access it, should something happen to you, and they need access to your accounts. While you are in there, you should CHANGE your security questions (ie. such as mother’s maiden name, place you were married) and add a second email address to contact you if you lose your password. It takes about 10 minutes to change passwords on an account. With the average of 20 passwords, this will be a time-consuming task. We cannot help all our 5700 customers at once, so we encourage you to try this yourself. Just click on the links in the list of companies above for directions. If necessary, set an appointment for us to help remotely at $80/hour, but we believe with patience, you can do this yourself. We suggest you change your passwords at least 1x a year. As I’ve said for months, XP is no longer supported by Microsoft. XP Viruses are expected to rise 66%. Your computer is more than 8 years old, and it will require hardware failures soon regardless. You need to get a new Windows 7 or 8 computer. Brand doesn’t really matter, but we suggest a fast i5 processor for about $550-$700. MicroCenter has the best selection and is the ONLY retailer in Colorado where you can still get Windows 7. This program gets SPYWARE and MALWARE, which Anti-“VIRUS” programs don’t detect. We’ve seen a dramatic decrease in customers with spyware since we’ve suggested this in October. We believe EVERY HOME AND WORK Windows Computer needs this! They discontinued their lifetime version, and replaced it with a $25/”YEAR” version. Luckily, (in my great wisdom and forethought), we bought 1000 “LIFETIME” copies for our customers, in addition to the 2500 we’ve already installed since October. The LIFETIME no longer available from Malwarebytes. Let is know if you want a copy and we can email you the codes. If you don’t have the manual free version or need the newest update we recommend ALL WINDOWS USERS CLICK HERE NOW to install it. With the number of clients needing immediate attention, our phones are ringing off the hook. Please email us any questions you have! BAD NEWS: If you have Windows XP or need a new computer, READ THIS SECTION! Through our national radio broadcasts and through these newsletters, we’ve been warning of the end of XP on April 8 (just a few days away!) At that time, XP users will no longer get security updates and XP Viruses are expected to spike 66%! 90% of ATMs in the US are running Windows XP. I’m not sure what is going to happen there, but I wouldn’t use ATMs for a while (if you even can). Short Story: You need to get a new computer. There isn’t anything “wrong” with Windows 8, but Windows 7 is easier. The only place in Colorado that still has Windows 7 is Microcenter, but they are running out of the one I recommend (Click here to get details). I bought 17 the other day for clients! Microcenter gets a truck of 40 every few days, and sells them all out before the next truck. I have arranged to have 3 computers on hold at Microcenter. Just ask any of a computer salesman in the desktop section for the “Dell i5 Windows 7 computers on hold for Scott Henke’s customers”, and he can see if they still have any left. Long Story: I’ve had a series of 1-hour courses (usually $80), for free at Microcenter on how to buy a new computer. However, because these were getting so large that they’ve asked that we hold off until after the XP rush ends. So, we are providing the same podcast ONLINE! All my shows on www.velocityradio.fm will soon be available via podcasts. This is the 45 minute show explaining the “13 Choices you need to make when getting a new computer.” You can download this handout from the class here so you can follow along. Get the best antivirus program you can: We recommend ESET, Kaspersky, or BitDefender. We believe ESET is the best and fastest for $30/year. Get Malwarebytes Professional (see below) for $30/lifetime version. Do all your Windows Updates before April 8. Watch this video from another tech company here. …and don’t say we didn’t warn you! Spyware and Viruses are the #1 concern of our customers. Since November, we’ve recommended Malwarebytes Professional and had a dramatic reduction in customers coming in for spyware removal. This is a supplementary program which prevents and removes “SPYWARE” which antiviruses don’t even scan for. It’s been reported that if Target had this installed on their computers, their security breach may never have happened. Our psychic abilities knew that their LIFETIME version was being discontinued and replaced by an annual subscription for $25/year. This just took affect last Monday. The free version will help remove spyware AFTER it infects the computer. The paid version will minimize the threat BEFORE installing in the first place, then automatically scan for spyware to double-check any that may have gotten through. If you already have Malwarebytes FREE or the PROFESSIONAL (Now called “Premiere”) version it will automatically upgrade to the newer version which scans even more thoroughly. We will send out details on the new version in the next newsletter. Education is key to not throwing your computer out the window. We have free online courses at LearnItAnytime. Email me for our username and password. We will be putting our most popular podcasts from some of our recent radio shows here. We appreciate your trust in serving you over the past 33 years! Let us know how we can help! “I reached out a few times to ALL our customers, and we have you listed as a business customer. So, we thought we would email again with this warning. You already cannot get to other websites on Internet Explorer 8 such as www.abc.com on XP, and others will quickly follow. Most ALL financial agencies are requiring you to replace XP such as Insurance Agents, ATM Operators, and other agencies which have compliance regulations. 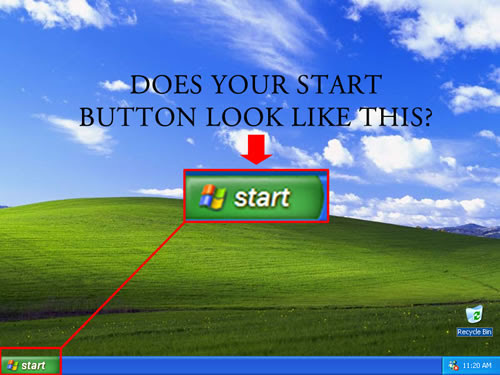 Unless you have a free Windows 7 upgrade and little data, it is typically not cost effective to upgrade your Windows XP or Windows Vista computer. The computer must be completely backed up, erased, reloaded, the data transferred back, then the computer set up again. However, you will still have a slow, computer with a hard drive past it’s 5-7 year expected lifespan. We do NOT sell computers! We recommend going to Microcenter. We suggest these Windows 7 PCs because they are fast and have an easier learning curve than Windows 8. It takes about 1 week to get your business evaluated, computers purchased, data moved, and computers set back up again. The average total cost is about $900 to $1200 per computer. We are estimating about 20% of our clients are still on XP. We have close to 6000 clients. Do you see why we are encouraging you to act now! If you have a business more than 5 computers and would like us to come out for 1-hour for a free consultation, please email me back or call the office to set an appointment for KEITH to come out next week. He will determine how many you need, which operating system, which software you may need to purchase, and get you on the right track. If you have less than 5 computers, then we have to charge our normal $120/hour rate for this evaluation. This Saturday at 9am, we have another free class at Microcenter before the store opens. This is normally an $80 class. I’ve attached the handout of the 12 main decision points to be made when purchasing a new PC. YOU MUST preregister, since we are entering the store 1-hour before it opens to the public. We are expecting a lot of issues after XP retires, so we want to give you all the info you need to have a head start on avoiding frustrations later. With EVERY Windows Computer, we are suggesting upgrading to Malwarebytes Professional which is only $25 for a lifetime subscription. This is an extra layer of spyware protection not covered by ANY antivirus program. It’s been written that this simple program could have prevented the Target credit card breach a few months ago!